BSC (Hons) Physiotherapy, MRes Clinical Research, PGDip Veterinary Physiotherapy (ACPAT - Cat A). 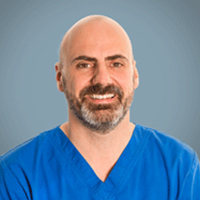 Andy qualified as a chartered physiotherapist at the university of Brighton in 2003. Since then he has worked in a variety of both inpatient and outpatient settings and has specialised in the rehabilitation of patients with advanced cancer over the last 9 years. He is also interested in research and successfully completed a master's degree in clinical research at the university of Southampton in 2013. He completed a postgraduate diploma in veterinary physiotherapy at Hartpury college in June 2017.